Data management can be complicated. Let us simplify it. Part of our exclusive Farmacology® suite of agronomic tools and resources, the Legend Edge allows you to record, consolidate, and use your data as you make farming decisions. "With the LS 10R551N variety, along with the Farmacology® program provided by Legend Seeds, I nearly doubled my average yield." Already have a Farm Management solution? That's OK! Working with your dealer we can take data you already have, import it into the Legend Edge, use it to create hybrid recommendations, or export any variable rate seeding prescriptions for use in your existing platform. 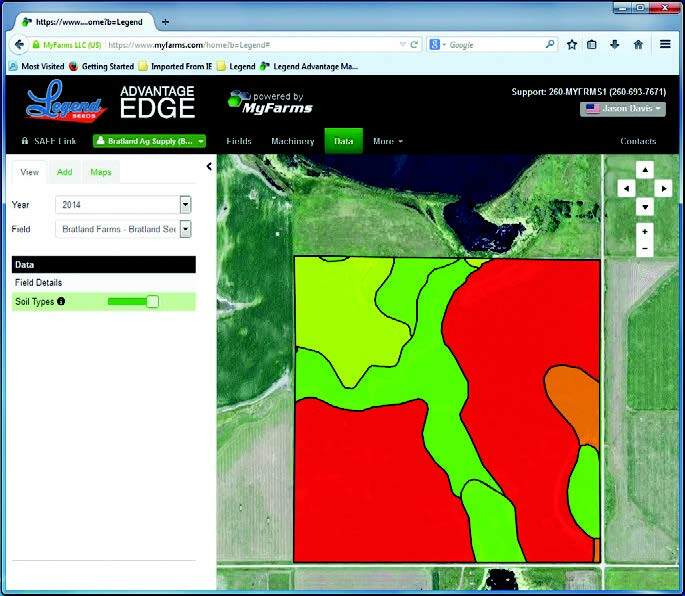 Powered by MyFarms, the Legend Edge is a cloud-based software platform offering tools for basic field management, field mapping, keeping track of which hybrids are planted where, soil sampling data, input data, spray dates, calculating growing degree units and determining maturity dates to provide variable rate prescriptions, writing dual hybrid prescriptions and interfacing with drone technology. Unlike many other precision ag software platforms, you retain ownership of your data, and best of all, it's FREE to Legend Seeds growers. Contact us to experience the benefits of the Legend Edge on your acres.